WEBs-AX Enterprise Security is a comprehensive access control and security management solution, built on a truly open, IP based platform. 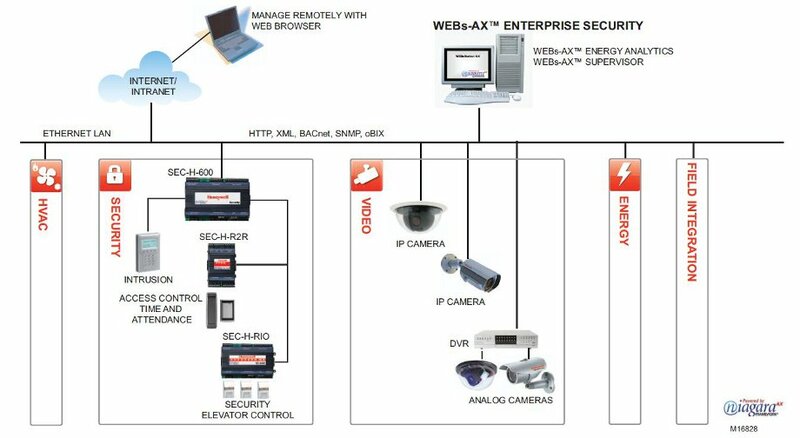 Developed using the NiagaraAX Framework, WEBs-AX Enterprise Security provides unparalleled interoperability within traditional security environments and extends seamlessly to create a unified, intelligent building by integrating with today’s diverse facility systems including environmental controls, lighting, energy management, and video. The core architecture of WEBs-AX Enterprise Security is proven and designed to solve the complexities of integrating disparate systems in real world scenarios. Enterprise Security provides scalability ranging from single door solutions to multi-building/multi-campus deployments. Entirely accessible from any standard web browser, the solution provides flexible access into the system any time, anywhere, while liberating end users from dedicated client workstations in the traditional client /server model. WEBs-AX Enterprise Security is open – open architecture, open framework, open distribution, and open protocol support. The WEBs-AX Suite of products integrates today’s diverse building systems such as environmental controls, security, lighting, energy management, and video to create better buildings—ones that are smarter, use less energy, are more efficient, have lower operating costs, are safer, and contribute to a sustainable environment.